 How long can I hire a Chocolate Fountain for? Our standard hire time is 3 hours. We need an hour before your 3 hours start, to set everything up and get the chocolate flowing. Everything is prepared fresh at the venue. Longer hires are available on request. Can we have the Chocolate Fountain outside? No, Chocolate attracts flies, and we all know how unpredictable the weather can be. However, if the fountain is in a marquee outside, that is not a problem. Do you use oil in your Chocolate Fountains? No, we never use oil unlike some other chocolate fountain hire companies. We use only the very best Callebaut Belgian Chocolate, available in 10 different flavours. Can I choose my own dips? Of course. We have a choice of about 40 dips for you to choose from, so plenty for everyone. What can be dipped into the chocolate fountain? You can dip anything that will go onto a skewer and not crumble into the chocolate. Fruits and pastries are the most common. Our packages include many dipping items (up to 40 different items are available). What if a guest has a nut allergy? All of our chocolate is free from traces of nuts and our fruit palm trees are prepared in a nut-free environment. However, we use a variety of dips so will be able to provide further information regarding the ingredients and the location at which they are created and packaged, on request. The chocolate is heated, is it safe? We understand customer concerns regarding safety, especially where heating equipment is concerned. The chocolate is heated only to 60 degrees, which means it will not burn. Our uniformed assistants are health and safety trained and alert. They will always be close to the equipment to ensure nobody touches the heated elements required to maintain the temperature of the chocolate. What type and flavours of chocolate will you use? Exquisite Belgian dark, milk or white chocolate will be available as an option. We use only the best quality and can offer special diabetic chocolate, as well as flavoured (hazelnut, orange, strawberry, cappuccino, lemon and lime, caramel and honey). Our new speciality Bailey’s fountain will be supplied with delightful chocolate shot cups in which to place your favourite Irish liqueur.